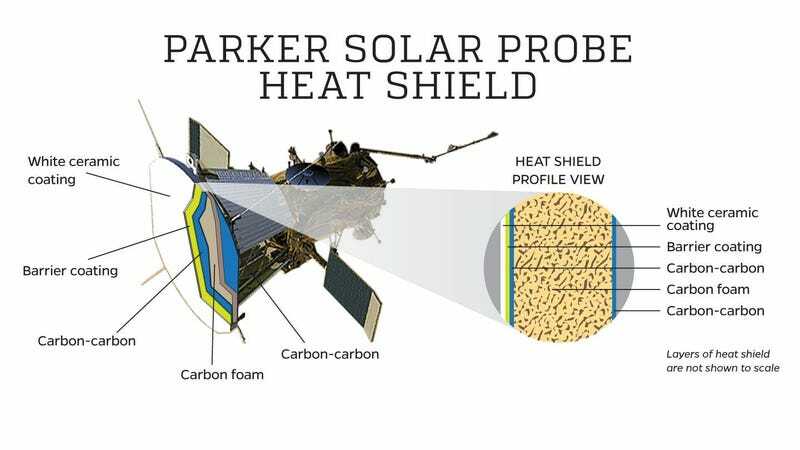 A human-made spacecraft is finally heading to the centre of the Solar System. NASA’s first launch window for the Parker Solar Probe began today at 8:33 a.m. If all goes well, the ship will then begin its journey to the Sun. That thermal protection system took 10 years to develop. It’s got two layers of carbon-fiber-reinforced carbon, which retains its structural properties in high heat. In between those layers is carbon foam, a material that’s mostly air and thus doesn’t transfer much heat. On top of that is an outer layer of aluminium oxide, a white material that reflects light. A layer of tungsten sits between the carbon and aluminium oxide so the two don’t react and turn the outer layer grey. The Parker Solar Probe will fly through the outer corona, but particles are sparse enough that they don’t transfer much heat to the ship, according to NASA. It’s kind of like reaching your hand into an oven — if it’s in there just briefly, it doesn’t hurt unless you touch the metal. Once the probe arrives, hopefully it will answer some of humanity’s burning questions about the Sun — but surely it will spawn new mysteries, too.